Every four years, the two political parties remake themselves in the image of their frontrunners. It’s almost difficult to believe, for example, that the same Democratic Party whose 2004 convention was a paean to a self-effacing, humble brand of national service, complete with a nominee “reporting for duty,” was in 2008 banking on the audacious hope of nothing less than transcendent change brought about by the force of one man whose unique life-story could heal a nation burned by the partisanship of the previous eight, and also 150, years, whom Greek columns did not embarrass and a football stadium was not big enough to contain. (If President Obama’s Denver acceptance speech has this texture of an acid flashback in your memory, don't blame yourself: it came about 12 hours before you met Sarah Palin.) Likewise, the Chris Christie we saw give tonight’s Republican keynote address (transcript here) was shaded to fit into the Mitt Romney Republican Party. It was as though you had taken an Instagram of the New Jersey governor and then hit the “Mitt” tint. Which is to say, it was recognizably Christie, complete with his very real skill at coming off as a very real guy as he talks to you about very real issues. But it was all muddled, corked like bad wine. He tried to serve the two masters of the Romney campaign and his own personal ambition, which could see him running for president himself in four or eight years, and ended up serving neither all that well. Christie might be his mother’s son, but he seemed to be describing how he sees himself when, early on, he called his father “gregarious, outgoing, and lovable.” It’s that image, along with his apparently matrilineal brand of doling out tough love, that has made him a popular and successful Republican governor of a blue state. In many ways, he started out as a YouTube candidate (even his ardent admirer Jennifer Rubin said as much earlier today—it’s really no disrespect to say so) who earned popularity on the basis of impromptu, caustic, real-talking, and quintessentially, well, Jersey lashings of opponents. Here’s a nice compilation. But tonight, Christie was fuzzy. His tone was firm, but never angry. He did not substantively go off-script, as he had teased he might (and as it seemed plausible he would, given the political persona he has built). While he touched on some of his favorite policy themes, such as taking on teachers’ unions, the focus of his speech was the Romney—and, perhaps even more so, Romney-Ryan—message of telling hard truths. The only attacks were coded. This didn’t make them ineffective—that the people of New Jersey “rewarded politicians who led instead of politicians who pandered” is a pretty decent dig at the disparity between President Obama’s persistent personal popularity and his job approval ratings—but did make them distinctly un-Christie. “We believe in telling seniors the truth about our overburdened entitlements,” sounds like the beginning to a Rep. Paul Ryan speech—and certainly Republican pundits, aggrieved at the re-election campaign’s misrepresentation of the Romney-Ryan Medicare plan, are going to lap up the section accusing the opposing ticket of “prey[ing] on [seniors’] vulnerabilities and scar[ing] them with misinformation for the cynical purpose of winning the next election.” (Yes, Ryan’s Medicare plan would not force anybody 55 or over into its voucher program; no, it would not leave them totally unaffected as far as Medicare is concerned.) But it did not feel authentic to what Christie is about. All in all, and excepting the lavish praise for his stewardship of New Jersey—which actually kept with a general theme of the evening, namely that Republican chief executives around the country are much better at their jobs than our Democratic chief-executive-in-chief—Christie played the good soldier, the guy who may not have been willing to sacrifice his job for the ticket but was happy, for his biggest political night ever, to sacrifice his message for it. Except where was Romney in the speech? Much is being made on cable and Twitter on how few times Romney’s name was mentioned in the speech (seven, none until well after the halfway point and five grouped all together). Sure, Christie was preceded by Ann Romney, who tried (successfully, in my opinion) to humanize her distant-seeming husband; and, sure, the candidate himself was sitting right there, watching, beaming, applauding, looking a bit pale and weird but whatever. 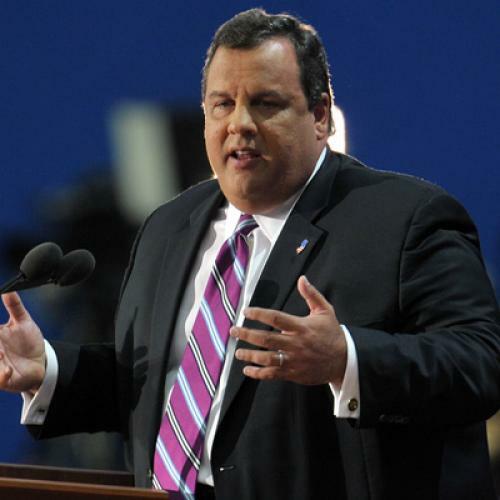 Even so: that was almost a Christie-for-president speech! Lest you think that is unfair, recall that by far the most famous and celebrated convention keynote address in recent memory, which featured, you will recall, “a skinny kid with a funny name” telling us about the pundits who “like to slice and dice our country into red states and blue states”—a speech, in other words, that certainly went a long way toward laying the groundwork for a triumphant presidential campaign four years later—mentioned the current nominee in whose honor it was given, Sen. John Kerry, a great deal, from “his heroic service [in] Vietnam, to his years as a prosecutor and lieutenant governor, through two decades in the United States Senate.” By contrast, while “Romney” got seven mentions, “Massachusetts” and “Michigan”—the latter having been all-but-adopted as Romney’s home-state, because it is inconvenient to talk about his time running the state of which he was actually governor—got exactly zero each. We heard nothing about Romney’s professional achievements—public or private sector—or even about his personal life, which with the five kids and 18 grandkids and loving wife is certainly enviable and attractive. It’s possible that this is all part of the campaign’s grand plan, of selling the cause and not the candidate—although that would certainly make Ann Romney’s speech brazenly anomalous (which indeed it was tonight). We will know more after the next two days. It could also be that Christie—who if the New York Post is to be believed could have been Romney’s running mate—is, as a blue-state governor, an early endorser (September 2011, right after deciding he himself wouldn’t run), and an extremely talented politician, is so necessary that part of the price of getting him to report for his own, smaller duty was to allow him to advance his private cause. Probably the truth is a combination of all-of-the-above: because ultimately, Christie’s speech, too, was all-of-the-above. A final note: cufflinks? I don’t own cufflinks—or rather, I do own a couple pairs, gifts from various life-events, but own no shirts that are compatible with them. I noticed Christie’s cufflinks immediately, though, and they seemed to belie the image of the down-home (or down-the-Shore, if you prefer), Bruce-loving, boisterous Jersey boy. Is this an affectation Christie picked up from all his extremely rich friends? Maybe it was one of the concessions to the campaign—another step in Romney-fying him? (I bet Romney wears cufflinks.) Whatever the explanation, they were a microcosm of the self-contradictory hodgepodge that was the 2012 Republican keynote.